BIO-Europe® is held annually in different cities and is an international forum to promote business development between pharmaceutical, financial and biotechnology companies. The event is Europe's largest partnering conference serving the global biotech industry. At this conference leading decision makers of the biotechnology, pharmaceutical and financial industry employed at emerging companies meet annually. Investors and pharmaceutical companies offer benefits to life-science companies that exceed financial investment. These benefits include information on questions reaching from regulatory and permit requirements to marketing and representations of interests for patients. Read about nandatec in the new Life Science Nord Magazine or download the online version (PDF) here. Many thanks to Life Science Nord for this opportunity and the portrait of our CEO, Dagmar Schneider. Read about nandate's latest very promising cooperation project with Wöhlk GmbH and FH Kiel in the Kieler Nachrichten (KN online) here. nandatec GmbH cooperates with FH Kiel and Wöhlk GmbH in order to develop an animal replacement model for nanomaterial testings. Project title: 'Veredelung von Contactlinsen durch superhydrophile und antiadhäsive Eigenschaften': Many thanks to the European Union-(ERDF), The Federal Government and Schleswig-Holstein. Many thanks Dr. Kirsten MIkkelsen and Europauniversity Flensburg for this opportunity to introduce nandatec with a WINspire talk (Dagmar Schneider, CEO) at the Schifffahrtsmuseum in Flensburg. We updated our policies due to the new GDPR. We recommend that you review the updated policies and let us know if you have any questions or concerns. Many thanks to JETRO and the Kobe Biomedical Innovation Cluster (KBIC), FBRI and LSN GmbH for organizing and enabeling the business delegation from Hamburg, Germany, to Kobe, Japan. Foto left to right: Dr.A.Fiebig (InterMedCon GmbH), Dipl.-Ing.J.Ruprecht (northh medical GmbH), D.Schneider (nandatec GmbH), S.Voelzow (Bluewater Medical GmbH), Dr.H.Habeck (Life Science Nord GmbH) and Prof.J.Boltze (Fraunhofer EMB) at the new Kobe City Eye Center, Center for Developmental Biology, RIKEN, meeting Dr. Masayo Takahashi. Many thanks to Sysmex and all other participants. nandatec GmbH will cooperate with FH Kiel and Wöhlk GmbH in order to develop an animal replacement model for nanomaterial testings. Project title: 'Veredelung von Contactlinsen durch superhydrophile und antiadhäsive Eigenschaften': Many thanks to the European Union-(ERDF), The Federal Government and Schleswig-Holstein. We are proud to announce that our CEO, Dagmar Schneider, was already nominated for IB.SH Unternehmerinnenpreis managing nandatec now for 4 years. 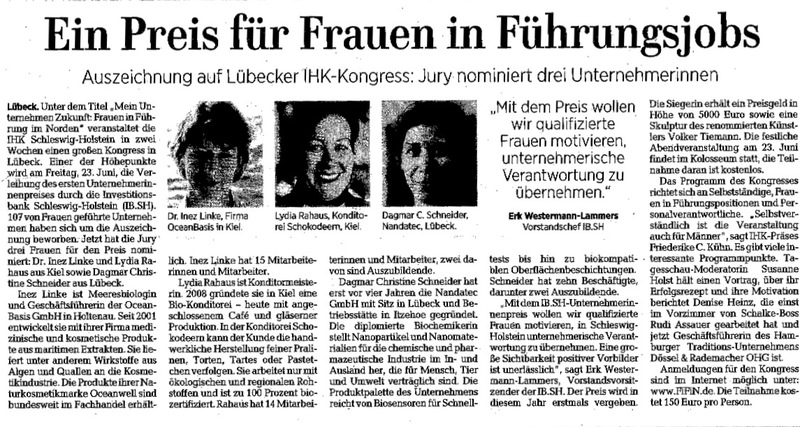 to Finanzministerin Monika Heinold (Grüne) and Frederike C. Kühn, Präsidentin IHK Schleswig-Holstein and all the people in charge who supported the IB.SH Unternehmerinnenpreis. Erk Westermann-Lammers (Vorstandsvorsitzender IB.SH), Dagmar Schneider (nandatec GmbH, Lübeck), Dr. Ines Linke (oceanBASIS GmbH, Kiel), Lydia Rahaus (Konditorei Schokodeern, Kiel), (left to right). Congratulations to Dr. Iris Linke, who won the finale with her company oceanBASIS GmbH, founded in 2001. 'In the project PANaMa, students in 9th or 10th grade will be introduced to activities that people in certain jobs will have to do in their daily lives and the knowledge base that doing these activities depends on. Students will find out what job opportunities there are available in their region. The project will focus on topic areas that have a regional connection but also a high potential for future growth and development: Energy, Agriculture, Nutrition, High-Tech Materials. The Project PANaMa is funded by Interreg Deutschland-Danmark with funds of the European Fund for Regional Development. Find out more about Interreg Deutschland-Danmark at www.interreg5a.eu. Life Science Nord opened the innovation network for patient security HIHeal (hygiene, infection & health). nandatec' s CEO Dagmar Schneider and other presented their products and/ or possible contribution in this promising network. The project is funded by the Europäischen Fond für regionale Entwicklung (EFRE) and the Behörde für Wirtschaft, Verkehr und Innovation of Hamburg. (foto: Life Science Nord), nandatec's CEO Dagmar Schneider was elected to the extended directorate of Life Science Nord e.V.. Successful business matchmaking event in Japan: nandatec was one of four companies (Bluewater Medical, InterMedCon and Provecs Medical) chosen to visit Kobe, Japan. Many thanks to Life Science Nord, JETRO, Kobe Biomedical Innovation Cluster (KBIC), Foundation of Biomedical Research and Innovation (FBRI), Sysmex, XFEL (Hyogo prefecture), Medical Japan (Osaka) and RIKEN's K-computer (foto) for the invitation. We are looking forward to our next meetings. nandatec is the idea giver and co-founder of the ZIM-BMWi funded network NanoFunDuS that was mentioned in the ZIM-BMWi-newsletter. NanoFunDuS was one of six networks that were asked to present their work at the network exhibition in November 2016. Our Bachelor student, Maximilian Seidenstecher, proudly presented a testkit prototype for meat type detection. The testkit was developed by nandatec in a ZIM- BMWi-funded network project. Cooperation partners are Amedon GmbH, BITSz electronics GmbH, Diagramm Halbach GmbH & Co. KG and Frankenförder Forschungsgesellschaft mbH. 09.01.2017 NEW! Launch of NANDATEC® FECT1, a biocompatible transfection agent for human stem cells. No pre-treatment or electroporation necessary. Transfection efficiency 92-94%! Further info and programm please visit http://www.micronanoconference.org/ . nandatec took part in the healthcare brokerage event on three days and was completely booked. Thank you for your interest in nandatec and the stimulating and efficient conversations. We are looking forward to our meetings, or see you next year at MEDICA 2017. Philipp Maximilian Seidenstecher, team nandatec, about 'Establishing a marine test system for anti-fouling compounds', 5 p.m.
Read more about nandatec in the newsletter of NINa SH e.V., Norddeutsche Initiative für Nanotechnologie and Life Science Nord Magazine Medtech, Biotech & Pharma 3/2016. 14.11.2016 Visit of Dr. Frank Nägele, State Secretary of the Ministry of Economic Affairs, Employment, Transport and Technology of Schleswig-Holstein. Many Thanks to Dr. Frank Nägele, State Secretary of the Ministry of Economic Affairs, Employment, Transport and Technology. Dr. Nägele and Dr. Habeck, Managing Director of Life Science Nord, staff members of WTSH and IHK Lübeck visited nandatec during the MEDICA in order to discuss and foster networking opportunities in Schleswig-Holstein and Hamburg. Thank you for this inspiring and fruitful conversation. We are looking forward to our next meeting. Ministerpräsident Torsten Albig and Bundestagsabgeordnete Dr. Karin Thissen visit nandatec GmbH. Thank you for your interest in nandatec' s new product NANDAtec® CLEANs1, Minister President Torsten Albig and Dr. Karin Thissen, Bundestagsabgeordnete. We enjoyed your visit during the Schleswig-Holstein Summer tour. It would be a pleasure to meet again. nandatec launches it's new product NANDAtec® CLEANs1 during the visit of Torsten Albig, Minister - President of Schleswig-Holstein. NANDAtec® CLEANs1 is a biocompatible surface modification for reduction of microbial contamination and algae. NANDAtec® CLEANs1 can be used for applications in Medical Technology and Marine Technology. The BioTec & MedTec Partnering Mission is supported by CBBM and Life Science Nord (Germany), Biopeople, Copenhagen Capacity and Dansk Erhverv (Denmark) and Invest in Skåne (Sweden). State Secretary of the Ministry of Economic Affairs, Employment, Transport and Technology of Schleswig-Holstein, Dr. Frank Nägele, visits nandatec. Visit of Dr. Frank Nägele, State Secretary of the Ministry of Economic Affairs, Employment, Transport and Technology of Schleswig-Holstein (middle), and Dr. Hinrich Habeck, Managing Director Life Science Nord GmbH (left), in conversation with Dagmar Schneider, CEO nandatec GmbH (right), at the MEDICA WTSH companies' pavilion. Since the 18 years of its existence the title "GründerChampion" has become a quality award for young enterprises. In the corporate contest of the KfW Bankengruppe German companies could apply starting from the founding year of 2010. In total 480 applications were received this year. That was the highest number of applications since the existence of the KfW AWARD GründerChampions. 2 of 10 funded secondments go to nandatec GmbH. 01.08.2015 Start of the ZIM-BMWi funded NanoFunDuS network project "Meat-Type-Test"
Lübeck Chamber of Industry and Commerce, Danish Ministry of Innovation and Region Skåne launch initiative to foster cross-border R&D projects. All fotos copyright by nandatec GmbH.